In this edition of Fear the Walking Dead Rewind, we look back at the fifth episode of the AMC series’ fourth season: ‘Laura” – a quieter, gentler “calm before the storm” before Althea (Maggie Grace), Alicia (Alycia Debnam-Carey), Victor (Colman Domingo) and Luciana (Danay Garcia) confront Mel’s (Kevin Zegers) Vultures. 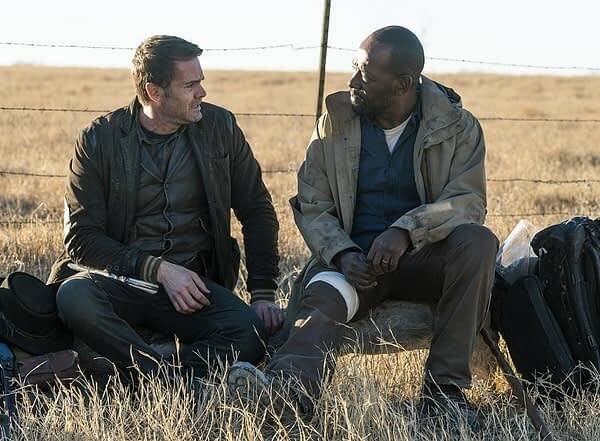 But before the mayhem, we get John Dorie’s (Garret Dillahunt) touching, heartbreaking backstory with Naomi/”Laura” (Jenna Elfman)- and quite possibly the best couple in the Walking Dead universe (okay…maybe second to Rick/Michonne). Fear the Walking Dead Episode 4×05 ‘Laura’: The arrival of a wounded visitor in John Dorie’s life forces him to change his ways. Fear the Walking Dead Episode 4×06 ‘Just in Case’: Strand wrestles with Madison’s decisions; things take an unexpected turn at the Stadium. In season 4, we will see the world of Madison Clark (Kim Dickens) and her family through new eyes — the eyes of Morgan Jones (Lennie James), who is joining the story from the world of The Walking Dead. The characters’ immediate pasts mix with an uncertain present of struggle and discovery as they meet new friends, foes, and threats. They fight for each other, against each other and against a legion of the dead to somehow build an existence against the crushing pressure of lives coming apart. There will be darkness and light; terror and grace; and the heroic, mercenary and craven, all crashing together toward a new reality for Fear the Walking Dead. AMC’s Fear the Walking Dead‘s fourth season stars Kim Dickens, Frank Dillane, Alycia Debnam-Carey, Colman Domingo, and Danay Garcia; as well as new series regulars Lennie James, Garret Dillahunt, Jenna Elfman, Maggie Grace, and Kevin Zegers. Produced by AMC Studios, the series is executive produced by Scott M. Gimple; showrunners Andrew Chambliss and Ian Goldberg; Robert Kirkman; David Alpert; Gale Anne Hurd, and Greg Nicotero.